Sweet, delicious, and a beautiful shade of blue, the berry white is a vodka martini you will not want to miss. This fun cocktail recipe mixes fruity flavors with a delicate chocolate accent and it is a fabulous addition to any party. The blue color of the cocktail comes from UV Blue, that tempting raspberry-flavored vodka which stands out from all the rest in the bar and liquor store. In this recipe, it is accented with orange and lime flavors along with a little crème de cacao for a hint of chocolate. 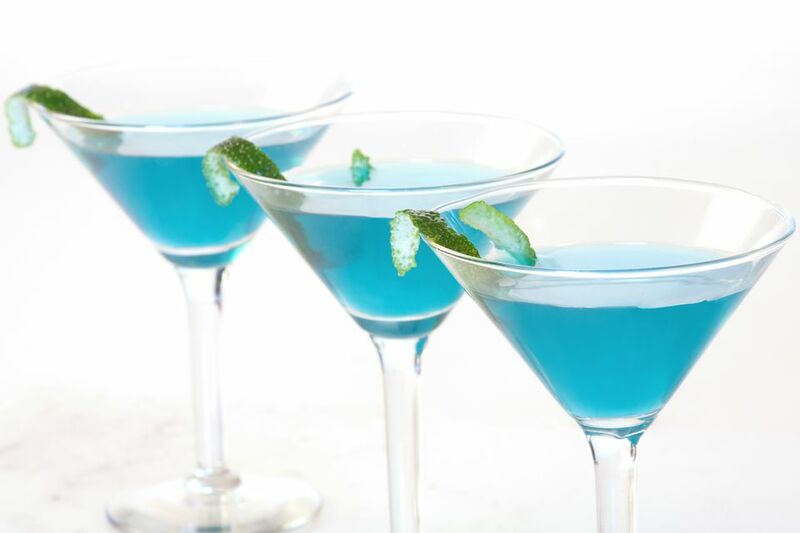 The result is a semi-sweet drink that is perfect for dessert or anytime you want a simple but impressive blue martini. While you can typically choose any brand of vodka you like for cocktails, this one relies specifically on UV Blue. No other vodka pairs the taste of raspberry with a bold blue color and there are no good substitutes available. Luckily, it happens to be one of the best affordable vodkas on the market, so it's also a good choice for the budget-conscious drinker. When choosing the chocolate liqueur, it's best to go with white crème de cacao. This is a clear, sweet liqueur that allows the vodka alone to control the martini's color. The dark variety of cacao is brown (as are most other chocolate liqueurs) and all of them will muddy up the look of the drink. You do not need to buy the best triple sec at the liquor store, but try to avoid the cheapest bottles. In cocktails as simple and clean as this recipe, each ingredient plays an important role in the finished taste. Besides, orange liqueurs will be used all the time in your bar as you explore drinks, so it really is a good idea to keep quality and versatility in mind when selecting one. Lime juice is just as important as the other ingredients. You'll find that the best berry white is made with fresh-squeezed lime juice. Limes typically yield 1/2 to 1 ounce of juice per fruit, so one lime will take care of one or two drinks. If you would like to add a garnish to this martini, a simple lime or orange twist would be an elegant touch. Cut the peel from the limes you're going to juice before slicing them open to get the most out of each fruit. To preserve a twist, place it in a glass of ice-cold water until it's time to serve the drink. How Strong Is a Berry White? UV Blue is bottled at just 30 percent ABV (60 proof), so it's one of the lightest vodkas you will find. In theory, that would make the berry white a pretty low-proof martini, but you have to keep in mind that two of the other three ingredients are nearly as strong as the vodka. With that, this cocktail's alcohol content should be somewhere around 20 percent ABV (40 proof), so you would need to drink two successively to equal a straight shot of the average vodka. The Zombie's Brew Has a Tart "Bite"